A Pearson correlation is a number between -1 and 1 that indicates the extent to which two variables are linearly related. 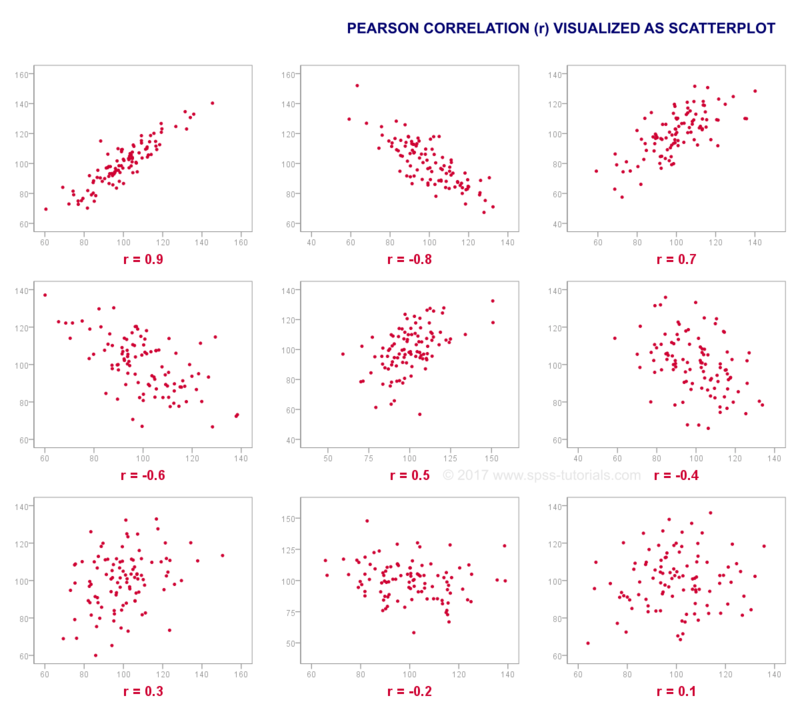 The Pearson correlation is also known as the “product moment correlation coefficient” (PMCC) or simply “correlation”. Pearson correlations are suitable only for metric variables (which include dichotomous variables). for nominal variables, use Cramér’s V.
We asked 40 freelancers for their yearly incomes over 2010 through 2014. Part of the raw data are shown below. and income over 2011? Well, a splendid way for finding out is inspecting a scatterplot for these two variables: we'll represent each freelancer by a dot. 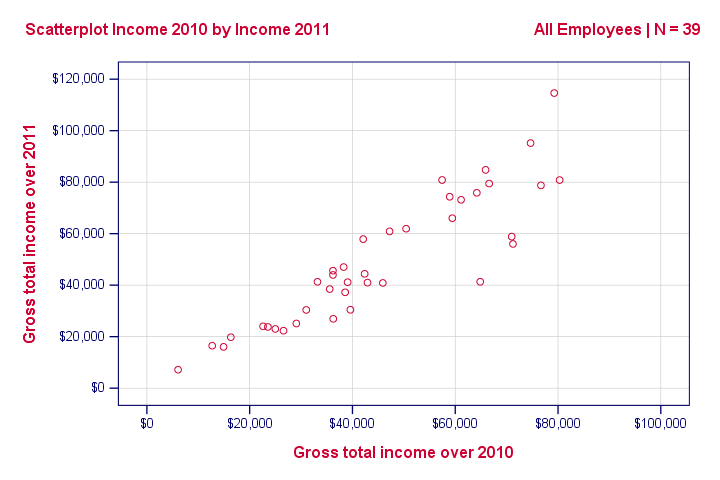 The horizontal and vertical positions of each dot indicate a freelancer’s income over 2010 and 2011. The result is shown below. Our scatterplot shows a strong relation between income over 2010 and 2011: freelancers who had a low income over 2010 (leftmost dots) typically had a low income over 2011 as well (lower dots) and vice versa. Furthermore, this relation is roughly linear; the main pattern in the dots is a straight line. The extent to which our dots lie on a straight line indicates the strength of the relation. The Pearson correlation is a number that indicates the exact strength of this relation. A correlation coefficient indicates the extent to which dots in a scatterplot lie on a straight line. 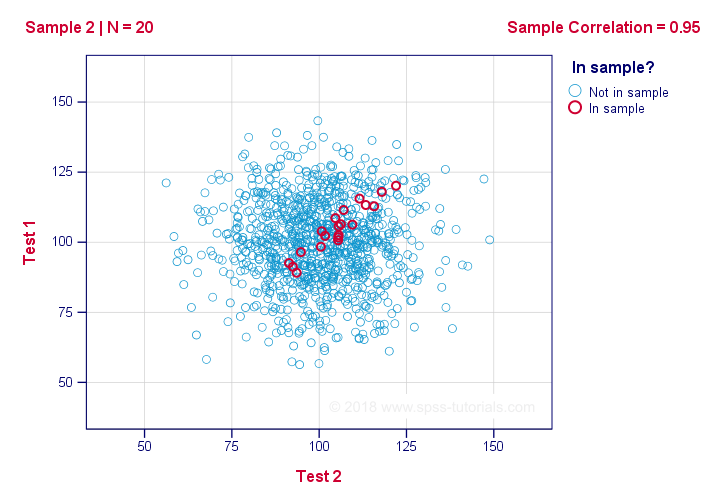 This implies that we can usually estimate correlations pretty accurately from nothing more than scatterplots. The figure below, in which the correlation coefficient is denoted by “r” nicely illustrates this point. Correlations are never lower than -1. A correlation of -1 indicates that the data points in a scatter plot lie exactly on a straight descending line; the two variables are perfectly negatively linearly related. A correlation of 0 means that two variables don't have any linear relation whatsoever. However, some non linear relation may exist between the two variables. Correlation coefficients are never higher than 1. A correlation coefficient of 1 means that two variables are perfectly positively linearly related; the dots in a scatter plot lie exactly on a straight ascending line. When interpreting correlations, you should keep some things in mind. An elaborate discussion deserves a separate tutorial but we'll briefly mention two main points. Correlations may or may not indicate causal relations. Reversely, causal relations from some variable to another variable may or may not result in a correlation between the two variables. Correlations are very sensitive to outliers; a single unusual observation may have a huge impact on a correlation. Such outliers are easily detected by a quick inspection a scatterplot. Most spreadsheet editors such as Excel, Google sheets and OpenOffice can compute correlations for you. The illustration below shows an example in Googlesheets. Keep in mind that correlations apply to pairs of variables. If you're interested in more than 2 variables, you'll probably want to take a look at the correlations between all different variable pairs. These correlations are usually shown in a square table known as a correlation matrix. Statistical software packages such as SPSS create correlations matrices before you can blink your eyes. An example is shown below. Note that the diagonal elements (in red) are the correlations between each variable and itself. This is why they are always 1. Also note that the correlations beneath the diagonal (in grey) are redundant because they're identical to the correlations above the diagonal. Technically, we say that this is a symmetrical matrix. Finally, note that the pattern of correlations makes perfect sense: correlations between yearly incomes become lower insofar as these years lie further apart. The formula basically comes down to dividing the covariance by the product of the standard deviations. Since a coefficient is a number divided by some other number our formula shows why we speak of a correlation coefficient. even if it's zero in the population. The figure below illustrates how this could happen. If we ignore the colors for a second, all 1,000 dots in this scatterplot visualize some population. The population correlation -denoted by ρ- is zero between test 1 and test 2. Now, we could draw a sample of N = 20 from this population for which the correlation r = 0.95. Reversely, this means that a sample correlation of 0.95 doesn't prove with certainty that there's a non zero correlation in the entire population. However, finding r = 0.95 with N = 20 is extremely unlikely if ρ = 0. But precisely how unlikely? And how do we know? Now, T itself is not interesting. However, we need it for finding the significance level for some correlation. T follows a t distribution with ν = n - 2 degrees of freedom but only if some assumptions are met. normality: the 2 variables involved are bivariately normally distributed in the population. However, this is not needed for a reasonable sample size -say, N ≥ 20 or so.The reason for this lies in the central limit theorem. In our example, the sample size N was 20. So if we meet our assumptions, T follows a t-distribution with df = 18 as shown below. This distribution tells us that there's a 95% probability that -2.1 < t < 2.1, corresponding to -0.44 < r < 0.44. Conclusion: if N = 20, there's a 95% probability of finding -0.44 < r < 0.44. There's only a 5% probability of finding a correlation outside this range. That is, such correlations are statistically significant at α = 0.05 or lower: they are (highly) unlikely and thus refute the null hypothesis of a zero population correlation. Last, our sample correlation of 0.95 has a p-value of 1.55e-10 -one to 6,467,334,654. We can safely conclude there's a non zero correlation in our entire population. 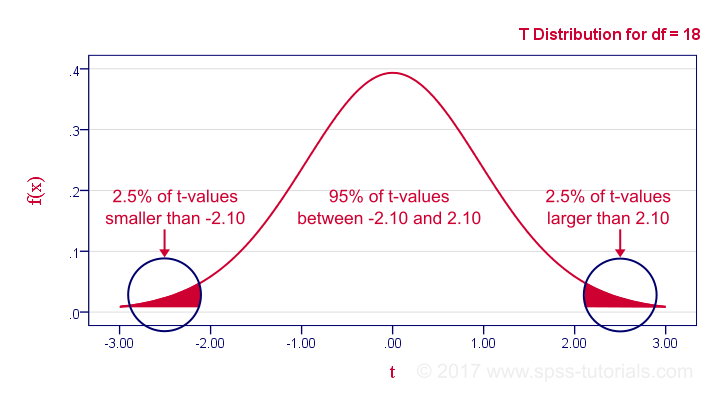 Next tutorial: Standard Deviation – What Is It? We usually don't know the population correlation. So we start off with a guess that it's zero -the null hypothesis. Given this guess, we can compute the probability for a given sample correlation -the significance level. And if this probability is very small, we reject our initial guess of a zero population correlation. This reasoning may need to sink in for a few days. But does it make any more sense now?